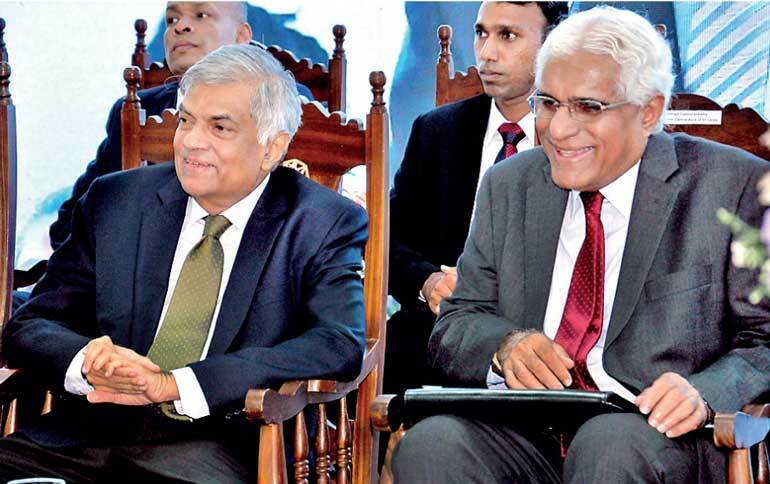 Delivering a wide-ranging assessment of the economy, Prime Minister Ranil Wickremesinghe yesterday hailed prudent fiscal management for tackling debt interest payments and outlined the way ahead for key investments and growth. Speaking at the opening of the new building of the Institute of Bankers of Sri Lanka (IBSL) in Colombo, he said the banking sector was an integral part of Sri Lanka’s backbone of macroeconomic management as it represents all related sectors of the financial system including banks and financial markets. The Premier also noted total gross assets held by the country’s financial system are estimated to be around Rs. 23 trillion, which is nearly two times Sri Lanka’s annual Gross Domestic Product (GDP). Further, these assets are nearly 38 times the total value of currency printed by the Central Bank. “We must be mindful that these financial assets have been created by us without any underlying real value or real wealth. Therefore, money, banking and finance are the bread and butter of our economy,” he stressed. It was pointed out by the Prime Minister that prudent finance management with long-term sustainability was essential. He also stated that the Government was maintaining a “safety net mechanism”. He explained that when the Coalition Government took over the economy it was heavily burdened with debt incurred through various unproductive infrastructure projects and the facility obtained by the International Monetary Fund (IMF) came in handy to manage the situation prudently, which helped to raise the Government’s revenue considerably through various tax reforms. “When we had to increase VAT there was a lot of criticism, but it helped immensely to improve our revenue. Today we are in a position to pay off the interest of the debts obtained, which I think is a huge achievement,” he stated. He emphasised that from here onwards the country needs to take some bold steps to stabilise the economy as it is still not in a position to completely pay off the debts on its own. “In the next five to six years our GDP will improve significantly and the revenue generated from that could be used to pay off those debts taken in the past. But until such time, we need to count on external funding facilities. I assure that the Government will only obtain those facilities with a vision and a source to repay them,” he pointed out. Furthermore, the Prime Minister said that they would soon start a debt management office, which will be under the purview of the Treasury. He outlined some major development projects that will take place in the next couple of months, including the Hambantota industrial zone in addition to the already commenced industrial zones in Pannala, Kuliyapitya, Koggala and Kalutara, which will generate a considerable number of job opportunities for the youth, thereby creating income sources which will uplift the living standards of all Sri Lankans. “There will be projects related to an oil refinery and LNG plants in Hambantota while many others are proposed to take place. The initial work to commence constructing buildings at the financial centre in Colombo is in the offing. India and Japan have come together to set up two LNG plants and a floating terminal,” he stated while elaborating on some of the key megaprojects. He said the proposed financial centre in Colombo will change the landscape of the financial system and economy of Sri Lanka. In addition, he said the Government was in the process of creating a South West Economic Corridor starting from Kandy going all the way to Hambantota, which has two airports and harbours. With the support of Singapore’s Surbana Jurong they hope to develop Trincomalee, Batticaloa, Anuradhapura, Polonnaruwa and Dambulla. “These are some of the economic zones and projects that the country is banking on to attract FDIs in the near future,” he added. He pointed out that the next big challenge was to see how many products Sri Lanka could export to the European market out of the 6,600 products under the GSP+ facility, insisting that it was high time the country decided whether it would stick to the traditional exports of apparel, rubber, fisheries products or allow foreign companies to come and expand our export product basket. He suggested that the IBSL Governing Board needs to have a wider network of professional academia to coordinate both theory and practicals, and the operational model to be accredited by globally recognised finance schools for quality, while maintaining its local flavour. “The overriding theme and focus of IBSL qualification models should be prudent business and not profit maximisation. IBSL should be in a position to produce financial managers for the hub of the Indian Ocean,” he added. The Premier said he was pleased to work on the IBSL Governing Board to support their reforms agenda fairly urgently to put the IBSL Tower opened yesterday into effective and productive use rather than rent it out to earn some money. “My legal team will be happy to assist and facilitate the introduction of necessary legal amendments to empower the IBSL with a new market base education mandate in the national interest,” he pointed out. Restricting the possibility of evading taxes, the Government yesterday moved the new Inland Revenue Bill yesterday in Parliament for its first reading. Lands and Parliamentary Reforms Minister and Chief Government Whip Gayantha Karunatilake moved the Bill, which will provide for the imposition of income tax for any year of assessment commencing on or after 1 April 2017. Prime Minister Ranil Wickremesinghe yesterday expressed his concern over the Supreme Court order prohibiting the Colombo Municipal Council from disposing garbage in Muthurajawela until 20 July. “I learnt that an interim order has been issued preventing dumping garbage at Muthurajawela. Waste disposal in cities becomes problematic when the courts start issuing orders like this. The spread of dengue and other health issues will increase. This is a serious issue and I direct the attention of the House to it. The Municipal Council, Police and Army are ready to intervene. The courts should also act responsibly during this crisis,” he said, questioning the legality of issuing restraining orders on an essential service. Moving on to other areas where garbage dumping has become a legal battle, Wickremesinghe stated that he hopes the Kesbewa Magistrate’s Court will give a favourable decision soon on the case pertaining to the dumping of garbage in Karadiyana. “The case at the Kesbewa Magistrate has been dragged on for three weeks now. I urge to expedite it and to give a ruling. We can appeal to the High Court if we are unhappy with the verdict. We can temporarily solve the matter without harming the environment in Muthurajawela if we can use the Karadiyana dump site,” he added, highlighting the possibility of summoning all stakeholders, including public officers, to courts before reaching a fair verdict. According to the PM, garbage disposal has become a problem, especially in the Colombo, Kolonnawa, Kaduwela, Biyagama and Kelaniya areas.